Following decades of organized campaigning led by charismatic and brilliant women from around the UK, in 1918, women of all classes, ages and professions came together in the triumph for voting rights for many women. Ten years later, this right was extended to all women over 21, giving women the vote on the same terms as men. TheRoad to Equality has continued over the last century, with many brave women and men campaigning on a broad range of equal rights issues. In June this year, as a wave of Processionscelebrating women and their long struggle for political and social equality comes to the UK, Google Arts & Culture has collaborated with more than 20 partners to bring online archival collections, video footage, and in-depth, visual stories of those who have helped shape history. For the first time, Google Arts & Culture is showcasing the work, lives and sacrifices of powerful figures like Emmeline Pankhurt, Milicent Fawcett, and Princess Sophia Duleep Singh. This online experience delves into the organizations they established, their revolutionary forms of protest, and the objects that represent their legacy—the iconic suffragette banners, their personal letters and writings, photographs, and hundreds of other artifacts. Inspired by the historic unveiling of a statue of suffragist leader Millicent Fawcett in Parliament Square, we partnered with the Mayor of London’s office on “Signs of Change,” a film project with the artist Gillian Wearing, and featuring the Mayor Sadiq Khan. The film shines a light on the achievements made by the women in history and contrasts them with contemporary figures. From teen activists and deputy mayors to local Londoners from all walks of life, the film highlights the diversity of ambitions for the future. Newly digitized scrapbooks from the Museum of London collection. Extremely fragile and not publicly displayed, these scrapbooks provide beautiful insight into some of the Suffragettes personal experiences. An editorial feature by the great-granddaughter of suffragette leader Emmeline Pankhurst on why the suffragette’s struggle remains so relevant and inspirational today. At just 18 years old, teenage campaigner Amika George is campaigning to make free menstrual products available to schoolgirls from low income families. Rosa May Billinghurst used her tricycle wheelchair, decorated in suffragette colours, to charge at police officers during demonstrations. Mary Somerville suffrage banneris part of the LSE Women’s Library beautiful collection of suffrage banners, commemorating scientist Mary Somerville. The UK’s first female press photographer Christina Broom meticulously documented the suffrage movement, giving an insight into the lives of suffragists and suffragettes across the UK. Women’s Day March poster is part of the Feminist Library collection. With bold colourful designs, the Women’s Liberation Movement continued the suffrage campaigners’ traditional of powerful feminist protests. Daughter of a Punjabi Maharaja, and goddaughter of Queen Victoria, Princess Sophia DuleepSingh sold the Suffragette newspaper outside her home at Hampton Court Palace, and joined the Women’s Tax Resistance League, refusing to pay her taxes until women were given the vote. Y B A Wife? Posteris from the Glasgow Women’s Library collections, showcasing playful and powerful ephemera legacy of women’s activism. Learn more about The Road to Equality and the men and women who have supported this movement by exploring the exhibition on Google Arts & Culture and on our iOS and Android apps. This entry was posted in Google Europe Blog and tagged Europe, Google in Europe on June 11, 2018 by Google in Europe. Last year, we outlined Google’s commitment to comply with Europe’s new General Data Protection Regulation (GDPR), across all of the services we provide in the European Union. We’ve been working on our compliance efforts for over eighteen months, and ahead of the new law coming into effect, here’s an update on some of the key steps we've taken. Use Activity Controls to choose what activity is saved to your Google Account. We provide simple on/off switches to control Location History, Web and App Activity, YouTube Search History and more, across all devices that are signed in to your account. View or delete data—including search history, location history, browsing history—from our services using My Activity. To make it easier to browse your past online activity, we have given you tools to search by topic, date, and product. You can permanently delete specific activities, entire days or weeks of activity that you don’t want associated with your account. Take a Security Checkup or Privacy Checkup to reassure yourself that your account is secure, and that your privacy settings work for you. We’ve recently added an option that allows you to subscribe to more frequent prompts to take the Privacy Checkup. Manage or mute the ads you see on Google, on websites and in apps using the recently upgraded Ads Settings tool and Mute This Ad control. We have provided more information about how and why certain ads are personalized, and will also be further simplifying the look and feel of these tools in the coming months. Get a clear overview of all the Google products that you use—and the data associated with them—via Google Dashboard. We’ve recently made the Dashboard more mobile-friendly so it's now easy to use across different devices. 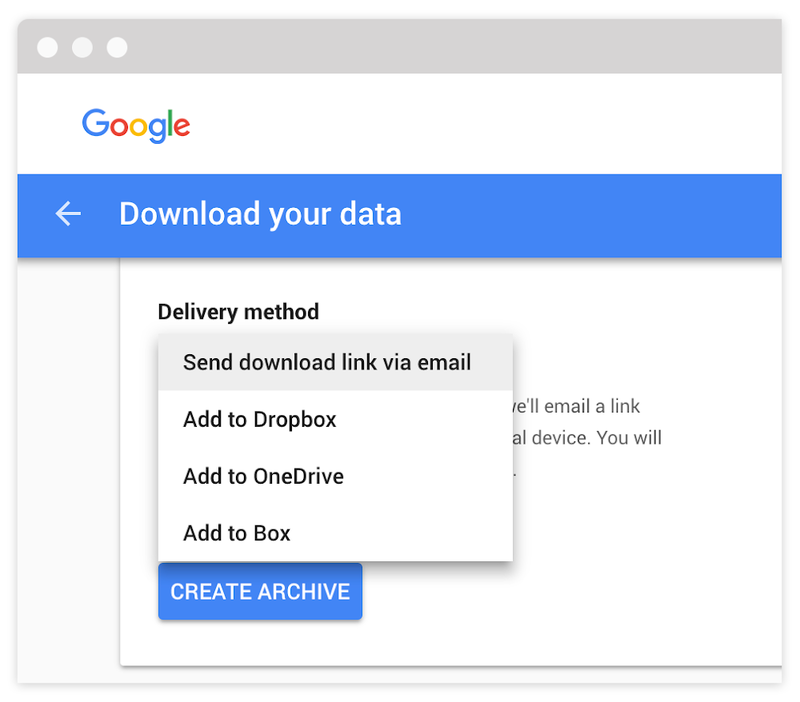 Since its launch in 2011, people around the world have used our Download Your Data tool to export data from products like Google Photos, Drive, Calendar, Google Play Music and Gmail, either to their own computer, or to storage services like OneDrive, Dropbox and Box. We are further improving and expanding this feature, adding more Google services, including more contextual data controls, and creating a new setting that helps people schedule regular downloads. While we’ve enabled people to download data from our services for many years, the GDPR encourages companies to enable direct service-to-service data transfers where feasible, for example from Google Photos to another photo service. To support that aim, we've recently initiated the Data Transfer Project on GitHub, providing early-stage open source code that will, in time, be of use to any developer wanting to offer seamless transfer of data from one service directly into an alternative (or vice versa). Under the new rules, companies must get consent from parents to process their children’s data in certain circumstances. To obtain that consent and to make sure that parents and children have the tools to manage their online experiences, we’re rolling out Family Link—already available in various countries around the world—throughout the EU. Through Family Link, parents can create a Google Account for their child and are required to provide consent for certain processing of their child’s data. Family Link also allows parents to set certain digital ground rules on their child’s Android device—like approving or blocking apps, keeping an eye on screen time, or remotely locking their child’s device. We plan to evolve Family Link’s functionality over time, working closely with parents and advocacy groups. The GDPR places new obligations on Google, but also on any business providing services to people in the EU. That includes our partners around the globe: advertisers, publishers, developers and cloud customers. We’ve been working with them to prepare for May 25, consulting with regulators, civil society groups, academics, industry groups and others. For our advertising partners, we’ve clarified how our advertising policies will change when the GDPR takes effect. We already ask publishers to get consent from their users for the use of our ad tech on their sites and apps under existing legislation, but we’ve now updated that requirement in line with GDPR guidance. We’re also working closely with our publisher partners to provide a range of tools to help them gather user consent, and have built a solution for publishers that want to show non-personalized ads, using only contextual information. For our Google Cloud customers, we’ve updated our data processing terms for G Suite and Google Cloud Platform and provided detailed information to customers about our approach to data portability, data incident notifications, secure infrastructure and third party audits and certifications, among other features. For more information, see this post on Google Cloud. Over the last decade, Google has built a strong global privacy compliance program, taking advice from regulators around the world. Across the company, we have dedicated teams of engineers and compliance experts who work in full-time privacy roles, ensuring that no Google product launches without a comprehensive privacy review. We’ve now further improved our privacy program, enhancing our product launch review processes, and more comprehensively documenting our processing of data, in line with the accountability requirements of the GDPR. This is a snapshot of things we’ve done to date to be ready for May 25, 2018. But our commitment to compliance with the GDPR, and the rights it gives people, will continue long beyond this date. As we evolve our products over time, we’ll continue to improve our Privacy Program and the protections we offer to users. Our ambition is to have the highest possible standards of data security and privacy, and to put our users and partners in control. This entry was posted in Google Europe Blog and tagged Europe, Google in Europe, Public Policy on May 11, 2018 by William Malcolm. Calling journalism students across Europe. If you have a passion for news, want to make and break stories and love technology, we have a program that brings all those skills together—the 2018 Google News Lab Fellowship. This year we’re offering placements across 10 countries. For the first time, news publishers in Belgium and the Netherlands will be taking part—the Fellowship will open here soon—and each of will offer new opportunities for students to gain valuable experience. Applications are open in the following european countries: Austria, Ireland, Finland, France, Germany, Sweden, Switzerland, and the UK. Country-specific applications can be found on the News Lab website. In the coming weeks, the participating newsrooms will select their preferred candidates and identify a Fellow by the end of May. The Fellow will then join the newsroom for a two-month summer placement, and Google provides a €5,500 stipend for each publisher to allocate. Fellows who have completed their placement in previous years say it was a “golden opportunity to get full-time work experience” and an invaluable start to their career in journalism. Attending a workshop in London, here are the 2017 News Lab Fellows, and one Googler—me on the far right! During their placement, the Fellows are invited to contribute their ideas to stories and new projects. From fact-checking to data journalism, video to audio, each newsroom offers a unique opportunity. In previous years, we’ve seen Fellows secure a frontpage story, bring new thinking to analytics and introduce emerging 360 technology to their newsroom. 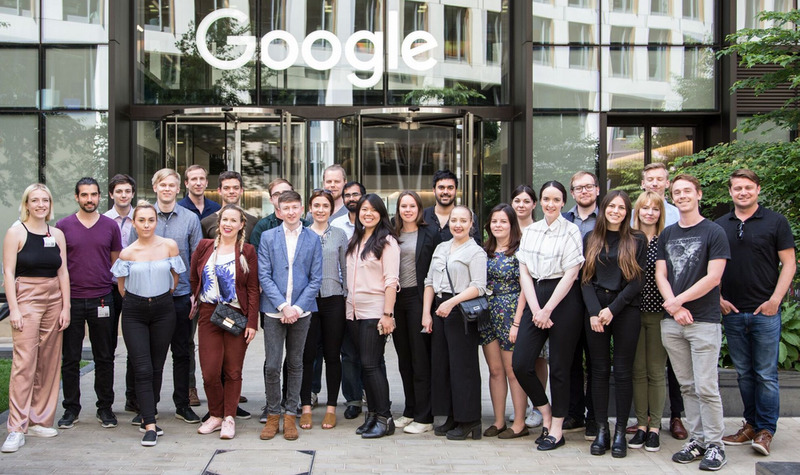 In 2017, selected Fellows from parts of northern Europe traveled to Google in London to take part in a training and innovation workshop. While here, they heard product experts from the YouTube Space and the News Lab and received practical tips to help strengthen their digital newsgathering and visualization skills. While the program isn’t available on an annual basis everywhere, there are currently Fellowships taking place in Australia, South Korea and the U.S., and we’re always thinking of how to expand and test the program in other countries. Thank you to all of the news organizations that are taking part this year—for example, Agence France-Presse, Wirtschaftswoche, The Telegraph and LCI—and those who’ve taken part in previous years. Good luck to everyone who wishes to apply! This entry was posted in Google Europe Blog and tagged Europe, Google in Europe, Journalism & News on March 1, 2018 by Matt Cooke. Since its introduction in 2015, the Digital News Initiative Innovation Fund has offered more than €90 million to more than 460 ambitious projects in digital journalism, across 29 countries. The fund, our €150 million commitment to supporting innovation in the European news industry, is designed to provide no-strings-attached funding to those in the news industry looking for some room—and budget—to experiment. Today the DNI Innovation Fund is open for a fifth round of applications—the deadline to apply is April 9, 2018. The Fund is open to established publishers, online-only players, news startups, collaborative partnerships and individuals based in the EU and EFTA countries. There are three categories of funding available: Prototype (up to €50k of funding), Medium (up to €300k of funding) and Large (between €300k and €1 million in funding). For more information on eligible projects, criteria and funding, see our website. We’re looking for projects that demonstrate new thinking in the practice of digital journalism, support the development of new business models, or even change the way people consume digital news. Projects can be highly experimental, but must have well-defined goals and have a significant digital component. Successful projects will show innovation and have a positive impact on the production of original digital journalism and on the long-term sustainability of the news business. As with Round 4, all Medium and Large track applications will need to demonstrate that they have a monetisation component within the idea to be eligible. This year, we’re also looking for ideas outside of the well-known approaches around paywalls. So in Round 5 we welcome a range of experimental and innovative approaches which diversify revenue streams. See the DNI Innovation Fund website for full details and and application forms. Applications must be made in English by April 9, 2018 at 23.59 CEST. We’ll announce recipients by mid July. New approaches have never been more needed so it’s time to experiment, innovate and try something new. We’re ready and waiting to help you bring your ideas to reality—submit your applications now! This entry was posted in Google Europe Blog and tagged Europe, Google in Europe, Journalism & News on February 28, 2018 by Ludovic Blecher. For Harry Potter’s fellow students at Hogwarts, “A History of Magic” is historian Bathilda Bagshot’s legendary chronicle of Wizarding history. And last year, we mere Muggles got our own version. “Harry Potter: A History of Magic” is an exhibition from the British Library containing rare books, manuscripts and magical objects from the British Library’s collection, capturing the traditions of folklore and magic from across the world, which are at the heart of the Harry Potter stories. Turns out, the exhibition was more popular than the Three Broomsticks on a cold day … it quickly sold out. To bring the Harry Potter magic to more fans around the world, hundreds of the exhibition’s treasures from London as well as 15 online exhibits are now available in six languages (English, Spanish, French, German, Hindi and Brazilian Portuguese, and more coming soon) on Google Arts & Culture. These examples shed light on what you’ll see in the exhibit. Lumos! Still waiting for your Hogwarts letter? For now, you can take your own Herbology class with Culpepper’s Herbal (used by J.K. Rowling for inspiration for Herbology coursework). Left: J.K. Rowling’s original sketch of the Hogwarts’ grounds (with her meticulous notes included). Right: The original synopsis of the first Harry Potter book. Check out the Divination room in 360-degree tour. Bloomsbury Children’s Books publishing director Rebecca McNally talks about the “Harry Potter Effect” and the enduring magic of the series. Jim Kay’s original painting ofHarry Potter and Draco Malfoy playing Quidditch. Visitors to the library explored the British Library’s 400-year old Celestial Globe (with constellations like Draco, Lupus and Sirius). Check out this video to see what it was like. To explore these magical traditions for yourself, check out The British Library collections online with Google Arts & Culture and on our iOS and Android apps. This entry was posted in Google Europe Blog and tagged Arts & Culture, Europe, Google in Europe on February 27, 2018 by Suhair Khan. Regions across Europe have changed throughout the decades, and so has the local job market. Technology companies can help address the challenges brought on by this change: through training people in digital skills, improving connectivity and by continuing to build large-scale data center facilities across Europe. To explore the impact of these data centers, we hosted an event, “Global technology, local jobs,” along with Debating Europe, today in Brussels. At this event we heard from EU Commissioner for Regional Policy Corina Crețu, regional development experts, and the consultancy Copenhagen Economics, who just published new research (commissioned by Google) on how investment in data centers, renewable energy and fiber is impacting Europe's regions. Since 2007, Google has spent EUR 3.2 billion on constructing and operating data centers in Saint-Ghislain-Mons, Belgium; Hamina-Kotka, Finland; Dublin, Ireland; and Eemshaven, Netherlands. We’ve also spent EUR 1.1 billion on European fiber networks to connect them, and thanks to signing power purchase agreements, enabled EUR 1 billion investment in renewable energy projects. Copenhagen Economics crunched the numbers on what this means for citizens, and found that Google’s data center and fiber investments have supported economic activity in Europe by EUR 5.4 billion in gross domestic product in total for the 10-year period from 2007 to 2017. Those same investments supported full-time 6,600 jobs per year on average over the decade, with a significant number of those jobs related to construction, with at peak moments more than 1,500 workers a day working on building one site. You can read the whole report on our data center site. Moreover, when Google grows, these communities grow—we support and work with local business, education, social enterprises and culture. At today’s event, Matt Brittin, Google’s president for Europe, the Middle East and Africa, shared the story of Frederic, who works in our Saint-Ghislain-Mons data center in Belgium. He grew up in Quievrain, studied in Mons, lives with his wife and children nearby and recently oversaw the construction of a new solar facility at the site—the second largest in Wallonia—which was built by a local firm. Google is committed to Europe, and we want to do more support communities like the 4,400 children who have received coding and robotics lessons through Hanze University of Applied Sciences in Groningen, near our Eemshaven data center, thanks to our community grants program. And there are many more stories from community members near our data centers about their experiences of having Google in their backyard. The Digital Single Market is essential in order for everyone in Europe to harness the benefits of tech. We look forward to the innovations that will be encouraged by its completion, and will continue our work to reinvigorate and invest in regions across the continent. This entry was posted in Google Europe Blog and tagged Europe, Google in Europe, Infrastructure on February 20, 2018 by Lie Junius. We are committed to making the internet a better, safe place for everyone. Whether it’s Google Play Protect automatically checking apps to keep your data and device safe, machine learning detecting harmful content on YouTube, or privacy controls in My Account allowing you to manage your data, we want you to feel safe while exploring Google. Keeping you safe, however, means thinking beyond just our products, which is why we partner across the industry to share technology like Safe Browsing that protects over half of the world’s online population from dangerous websites. We are also working with partners to establish reliability standards for publishers to use on their articles that help you assess the credibility of the information you discover. In honor of Safer Internet Day—an opportunity to come together to talk about online safety—we wanted to remind you of the new tools that we’ve launched in recent months that give you extra protection online. We’ll never stop improving our tools to help ensure your information stays safe with us. We recently rolled out a new version of our Security Checkup, which now provides personalized guidance to help you improve the security of your account. Instead of the same checklist for everyone, the Security Checkup is now a tailored guide to securing your data—your own personal security advisor. When you visit the checkup, you’ll automatically see your security status: a green check mark icon means you’re good to go, and a yellow or red exclamation point icon means there’s at least one issue for you to take care of. The new Security Checkup will keep evolving as new threats arise. You can count on it to provide you with relevant, up-to-date security advice that you can use to help keep your account safe. Take the new Security Checkup at g.co/securitycheckup. When operating at the scale of Google, we strive to build products that serve the needs of billions of people. But when it comes to online safety, we know needs differ among our users. That’s why back in October we introduced our Advanced Protection Program, which provides Google’s strongest security. Anyone can use Advanced Protection, but its design makes it of special interest to those who are at an elevated risk of attack and are willing to trade off a bit of convenience for more protection of their personal Google Accounts. For example, these might be campaign staffers preparing for an upcoming election, journalists who need to protect the confidentiality of their sources, or people in abusive relationships seeking safety. Sometimes even the most careful and security-minded users are successfully attacked through phishing scams, especially if those phishing scams were individually targeted at the user in question. Once you enroll in Advanced Protection, we’ll continually update the security of your account to meet emerging threats—meaning Advanced Protection will always use the strongest protections that Google has to offer. At the start, the program focuses on three core defenses. The strongest defense against phishing:Advanced Protection requires the use of Security Keys to sign into your account. Security Keys are small USB or wireless devices and have long been considered the most secure version of 2-Step Verification, and the best protection against phishing. An attacker who doesn’t have your Security Key is automatically blocked, even if they have your password. Protecting your most sensitive data from accidental sharing:Sometimes people inadvertently grant malicious applications access to their Google data. Advanced Protection prevents this by automatically limiting full access to your Gmail and Drive to specific apps. For now, these will only be Google apps, but we expect to expand these in the future. Blocking fraudulent account access:Another common way hackers try to access your account is by impersonating you and pretending they have been locked out. With APP, extra steps will be put in place to prevent this. Anyone with a personal Google Account can enroll in Advanced Protection. It’s compatible with Android and iOS, but you’ll need Chrome to sign up for Advanced Protection because it supports the U2F standard for Security Keys. We expect other browsers to incorporate this soon. For now, Advanced Protection is only available for consumer Google Accounts. To provide comparable protections on G Suite Accounts, G Suite admins can look into Security Key Enforcement and OAuth apps whitelisting. Sign up for Advanced Protection at g.co/advancedprotection. This entry was posted in Google Europe Blog and tagged Europe, Google in Europe, Safety & Security on February 6, 2018 by Stephan Micklitz. The strongest defense against phishing: Advanced Protection requires the use of Security Keys to sign into your account. Security Keys are small USB or wireless devices and have long been considered the most secure version of 2-Step Verification, and the best protection against phishing. An attacker who doesn’t have your Security Key is automatically blocked, even if they have your password. Protecting your most sensitive data from accidental sharing: Sometimes people inadvertently grant malicious applications access to their Google data. Advanced Protection prevents this by automatically limiting full access to your Gmail and Drive to specific apps. For now, these will only be Google apps, but we expect to expand these in the future. Blocking fraudulent account access: Another common way hackers try to access your account is by impersonating you and pretending they have been locked out. With APP, extra steps will be put in place to prevent this. Data centers are the backbone of the internet, housing the systems and equipment that make our connected world possible. We opened our first European data center in Belgium back in 2009, and now we’re announcing plans to build a third building on the same site. We’re also announcing a new solar plant—the first solar facility we’ve built on a data center facility site. We will invest approximately EUR 250 million to build the additional data center building in Saint-Ghislain, bringing our total investment in Belgium to EUR 1 billion. It’s due to be completed and operational by mid-2019. The new solar plant, which is already up and running, represents a previous investment of EUR 3 million. And we’ve learned that it is the second-largest solar plant in the region! The photovoltaic installations will feature 10,665 solar panels and will generate 2.9 Gigawatt hour of clean, reliable, renewable energy every year. Construction began in March 2017, using a local company to install the solar farm on four hectares of land in our data center. Ultimately, the solar project will contribute to a greener footprint on our data center campus, already one of the most energy-efficient sites globally. It’s not the first time we’ve acted on our sustainability goals in Belgium. Saint-Ghislain was the very first Google data center to run entirely without refrigeration, using instead an advanced cooling system that draws grey water from the nearby industrial canal. It also fits in with our wider goal of ensuring a positive impact on the environment. We are calculating our final energy bills and expect that we reached our target of 100 percent renewable energy for our global operations in 2017, including data centers and offices. This means we’re directly buying enough wind and solar electricity to account for every unit of electricity we use—and it makes Google the largest corporate purchaser of renewable energy worldwide. Demand for Google services grows every day, and the steady expansion of our network across Europe reflects this. Along with Saint-Ghislain, we have data centers at Eemshaven in The Netherlands, Dublin, Ireland, and Hamina in Finland. Each investment enhances connectivity. Data centers also benefit communities through job creation. The whole Saint-Ghislain site currently employs around 350 people in full-time and contractor roles—from computer technicians to electrical and mechanical engineers, to security, catering and facilities management. With this investment of EUR 250 million, we’ll create more construction jobs, and more full-time roles in Google once the third building is complete and operational. Charles Michel, Prime Minister of Belgium, joined us for an event this week announcing these projects, where he celebrated Belgium’s investment and ambitions as a digital pioneer. "The digital world is constantly changing, and Belgium is becoming more and more attractive for big investors like Google. This new investment is excellent news for the Walloon region and Belgium in terms of job creation." We’re grateful to the local and national government, local suppliers and community for their continued support of our data center presence in Belgium. We hope it contributes to make Belgium a digital frontrunner in Europe, creating jobs, skills development and economic opportunities. This entry was posted in Google Europe Blog and tagged Environment, Europe, Google in Europe, Infrastructure on February 1, 2018 by Joe Kava. Last week, we hosted the first Campus Creativity Week at Campus Madrid, one of Google for Entrepreneurs’ six spaces for entrepreneurs to learn, share ideas, and launch startups. Over 100 artists and entrepreneurs gathered from across Spain to explore how creative minds can use technology and inspire one another as they create art and build businesses. Artists and entrepreneurs share a similar challenge—to create something new with limited resources, no instruction manual, and the power of their creative thinking. For seven days, we celebrated unique approaches to this challenge, with a a mind-bending series of artist exhibitions, creative thinking workshops, and community-inspired artwork. We’re grateful to each one of the participating artists and entrepreneurs for sharing their time, expertise and talents with our Campus Madrid community. Artist Maria del Prado and photographer Juan Herrero collaborated on a daily series titled “Crystal Startups.” To represent that ideas take time to crystallize, each day they created installations of objects (inspired by Campus Residency startups) undergoing crystallization. Valeet, the startup represented by the red car above, is a resident company building an on-demand valet parking and car services app. Muralist Antonyo Marest creates artwork inspired by the ongoing talks at the Gaudi-inspired workshop. Sculptor Juan Garaizabal has been commissioned to create many monuments around the world. On stage at Campus Creativity Week, he demonstrates how Tilt Brush enables him to push his artistic limits and prototype even more rapidly than with his typical steel tools. Creative mind Eduardo Santamaria adds some flair to Campus Madrid’s community stairs using artist Antonyo Marest’s patterns. Participants of the Gaudi Inspired Design Thinking Challenge in front of Campus Madrid. Artist Guillermo Fornes used the walls to project his video ORIGEN, which shows biodegradable ink flowing through a river, referencing what it’s like for entrepreneurs to pour their energy into a startup idea and grow their business into something bigger. adopted Campus Madrid’s external windows as his canvas with his calligraphic script. Since we launched Campus Madrid in 2015, we’ve welcomed over 38,000 members, with startups working in fields as diverse as ecommerce, education, data analytics, and health. Six Madrid-based startups participate in Campus Residency, a six-month growth program for dozens of startups across our network that offers personalized support and unique access to Google resources, experts, and global connections. Startups in the Campus community worldwide have created more than 11,000 jobs and raised more than $537 million in funding. We hope you’re as inspired as we are by all of this progress, and by our Campus Creativity Week with these talented entrepreneurs and artists. This entry was posted in Google Europe Blog and tagged Entrepreneurs, Europe, Google in Europe on January 23, 2018 by Miguel Mayher.